I drafted this post some time ago (early July, just home from the Retreat) then published the post by Jess and never got around to expressing my own experience… Today I found this sitting in my drafts folder and thought I should just press publish – here are my thoughts, they are, raw, unedited and quite possibly not coherent! If you want to read another participants take on the retreat, Emma has given a wrap up here. We had two absolutely amazing weekends and have some more coming up as well as plans for a more permanent space, I can’t wait to have you along for the ride! Wow! The very first of The Creative Retreats have come and gone. I am just home and have a big, full cup. Community has been built, creativity has been fuelled and boy oh boy am I overflowing with gratitude for so much. I’m grateful for the attendees, without them taking time away from family, work and caring commitments, believing in the unknown and committing to being present, we would not have had such a blast. A complete blast. At each location, the sewing room was full of encouragement, support and hilarity round the clock. From the one who had never attempted making a quilt to the one who owns a quilt shop and the one who writes quilt patterns, books and designs fabric for a living and everyone in between, we had a large range of technical skill and experience. These wonderful participants placed their trust in me to bring them an untested experience, thank you all for coming and participating wholly. To Cheryl, who put blind faith in me to bring her outside of North America for the first time, who gave her all and was an absolutely amazing tutor, thank you. I miss you already and can’t wait to have you back again! And then there’s the team I worked with to pull this thing off. Bianca who created my website and provided small business advice and assistance, Sylvia who encouraged me for years to follow this dream, Claire who folded more fat quarters than anyone should ever have to fold and provided more support than I can possibly put into words. Special mention must go to two ace ladies who worked tirelessly across the retreat weekends, these two women are generous, supportive, kind and so damn funny. Nomes and Cath you are both seriously amazing. You were right there the whole weekend and you worked like crazy town from dawn to dusk and beyond. I had so much fun with both of you, my dear kitchen slappers, and you know I could never have managed so much behind the scenes without the two of you. I’m so, so, so grateful for all that you did, all that you are and I hope your hands are starting to recover – I owe you both some hand cream! Love you both, thank you. And while I’m on the train, there’s one last mention of gratitude I have to make, to my family. To the Mr who picks up the slack at home while I’m away and provides encouragement, support, reality checks and washing services and to our three smalls who have all helped this come about in their own special ways, our dreams only happen with the support of the people who love us and I can’t do what I do without my family. I’m already planning the next retreat in November, can’t wait to tell you who the next tutor is! 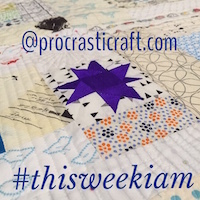 This entry was posted in collaboration, Creativity, Cultivating Creativity, family, Friends, quilt, The Creative Retreat on September 7, 2016 by procrasticraft.